"Once we began the attack I started to pull and I never looked back. We had one opportunity today." Those were the words of Astana's Mikel Landa after stage twenty at the Vuelta a España. Landa and his teammates began the day with Fabio Aru 6 seconds back from race leader Tom Dumoulin and four first-category climbs until the finish. On the final mountain stage in the final week of the final Grand Tour of 2015, a breakaway of nearly 40 riders rode to an advantage of nearly 14 minutes before Astana Pro Team began to increase the pace in its chasing group. As the speed increased, Andrey Zeits and Luis Leon Sanchez dropped back from the big breakaway to help go even faster. On the penultimate climb Diego Rosa, Dario Cataldo and finally Mikel Landa all rode to put Dumoulin under pressure, but the strong Dutch time trialist held on until nearly 50km to the finish. Then Landa attacked and Dumoulin lost contact. Aru moved clear with several elite leaders in a small group, and until the finish put an advantage of more than 3:45 over Dumoulin to end his time in the raceleader's red jersey. Ruben Plaza of Italy won stage twenty 3:38 ahead of Aru. Aru now leads the Vuelta a España by 1:14 over Joaquim Rodriguez of Spain with one stage remaining in to Madrid on Sunday. Alessandro Vanotti started Saturday by announcing that he would withdraw from the Vuelta after a crash on Friday left him with a deep contusion to his coccyx. But as pain decreased after breakfast Vanotti reexamined his decision to abandon and instead took to the start to finish with a large bunch of support riders at the end of the race. "I thought that I had to give my best and that’s why we decided to start strong. Vanotti took the start despite breaking his tailbone in a crash yesterday, he could barely walk. We focused to give the maximum and we got this result thanks to the work of the team," Ari said. "Dumoulin has been proving he is very strong since the start of the Vuelta, he’s an outstanding all rounder. He rode a fantastic Vuelta and I’m going to congratulate him. It was a good terrain to attack. My team worked hard and Mikel (Landa) did a great job in this Vuelta, winning the stage and helping the team. When I saw that we only had 25 seconds I wanted to push harder and I saw Andrey (Zeits) and Luis Leon (Sanchez), who worked well to increase the gap. "My team mates and were very motivated even after I crashed yesterday. The parcours was not easy today. This morning I could talk to Tiralongo who motivated me, but I never forget that my idol is Alberto Contador, who shows that attacking always pays off eventually. "At the beginning we made a small difference and when we saw that Dumoulin was coming back, we eased up a bit to take the time to prepare another attack two kilometres from the summit. We saw he was tired. "The course was tough and my team mates were strong to get in the breakaway, the work they did was incredible. "The time trial was a very important stage, there were big differences. I was prepared for this stage but I can’t say I was happy with the result although I fared better than during the Giro. I know I must work on that because it’s important on grand tours. The Vuelta was very hard and stressful and it was important to stay as fresh as possible mentally until the last day. 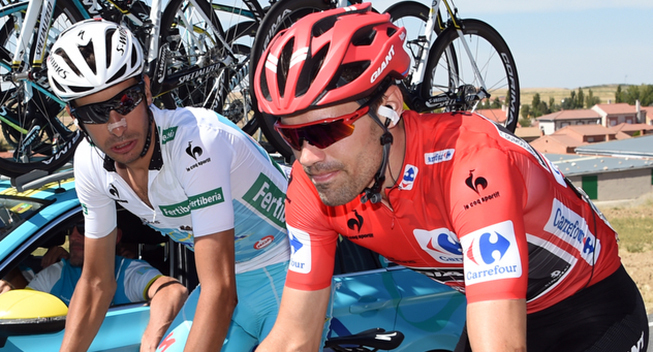 "Mikel proved he is a great rider and a strong candidate for grand tour titles. It’s a bit sad that I won’t be able to ride with him next year because we have a good relationship. He put his ambitions aside for me and it’s not easy for a 25-year-old rider. However he managed to win two stages on the Giro and one stage on the Vuelta. "I won't do the Worlds. The course does not suit my characteristics. I talked to Davide (Cassani) and I’m happy that another rider takes my place. "You know the relationship I have with Tiralongo. He’s a team mate but he’s essentially a friend who tells me when I make mistakes so I can learn. Paolo does not always tell me I’m a champion, he taught me to keep a low profile and my feet on the ground even when I have good results. "I have not taken part in the Tour yet and I would love to but that’s something that will be discussed with the team when we set the goals for next year. "Vincenzo [Nibali] is a great champion who has won the three grand tours and also got many podium finishes. Who is the leader is not the question, we want to get results, he has goals and I have others. He had to leave the Vuelta but if he had stayed the goal would have been the same: get a good result for the team." "We've been trying all season to win a Grand Tour and it has finally arrived," Diego Rosa said. "We never gave up but it was very difficult with the withdrawals of Paolo (Tiralongo) and Nibali and Aru's crash. Today we started in a convinced mood. We are a great team and we did a great job. Fabio has been very strong. He has deserved it. It is his moment to win a Grand Tour ".